For months now, I've been anticipating possibly one of Ottawa's biggest events for Canada's 150th celebration, La Machine. This past weekend Ottawa had two giant mechanical visitors, that I did not want to miss meeting. Since I am not currently located in Ottawa, I planned a day with my mom and although we spent a total of 6 hours on the road, it was defiantly well worth the drive. So what is La Machine? La Machine is a street theatre company based out of France with two main workshops, one in Nantes and one in Tournefeuille. Founded in 1999 by François Delarozière, La Machine is been constantly growing with its huge team that creates and runs all kinds of events and machines. The Dragon and Spider are only two of the many mechanic creatures/animals they have created. To learn more about Delarozière and La Machine - click here. Trust me, its worth the click. So before getting into my day walking around downtown with these beautiful creatures, take a look at who is who, and what their story is, and why they came to Ottawa. "From the ninth level of heaven, Long Ma, a cosmic creature who is, half-horse, half-dragon keeps watch over humanity. But a sinister force that has taken the form of a giant spider slips into his home as he sleeps, burning his wings and robbing his sacred temple. 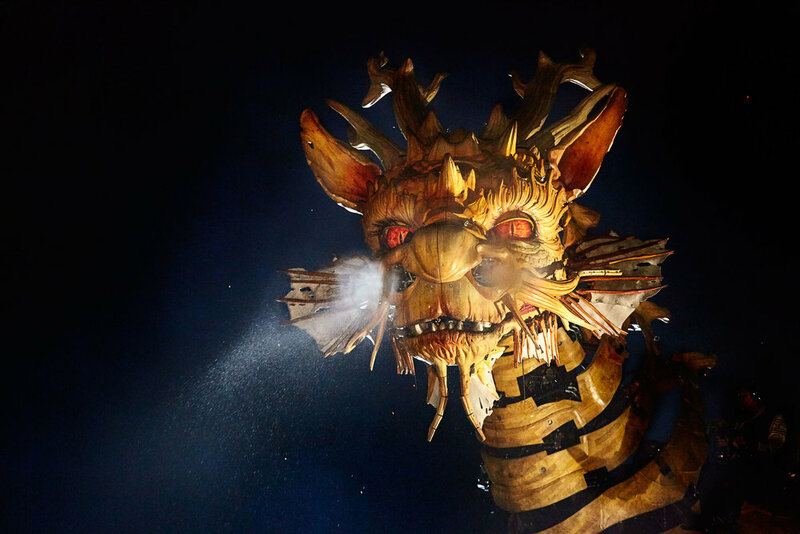 From this time forth, the Dragon-Horse roams the seven seas in search of his missing temple. The giant spider, Kumo, takes refuge in Ottawa, the mother-city of all spiders. Buried deep beneath the waves, the temple remains concealed. But the recent work undertaken by the city to build Ottawa's new transit line has disturbed Kumo, and she is forced to emerge from the ground. Her power depleted, the spider becomes vulnerable and loses control of the temple, which reappears in the city. Alerted by this apparition, Long Ma sets out on route taken by Champlain several centuries earlier, with the intention of recovering his temple of travel, a shrine that he alone has the power to properly restore." Long Ma defeated Kumo, receiving her wings back. Arriving downtown Ottawa at 2pm, my mom, my buddy Evan, and I went to meet Long Ma and Kumo. First we found Kumo sound asleep, and than Long Ma who was also asleep - and snoring. Never thought a snoring robot dragon could be so cute! While waiting for the creatures to awake, thousands waited and squeezed in the streets like sardines to watch the magic begin. A look behind where I was standing near Long Ma. We watched Long Ma awake from her rest, while Kumo was a street over, waking up not to long afterwards. They made their ways through the Byward Market streets to their next stops. Kumo went to the Supreme Court, while Long Ma went to City Hall. It wasn't until 9:30pm that night that they would meet again, and Long Ma would fight for her wings back. My favourite part of the night surprising wasn't the fight itself (but was still totally epic), but was how Kumo's controllers mounted her. They were lifted via crane, high up into the sky and once placed above Kumo, came down on ropes like they were spiders themselves. And with the music in the background created by Kumo's personal orchestra, made the moment that much more eerie and creepy. It was a perfect fit. It was truly an amazing experience, and I could not be happier that I did not miss out. It's insane to think the amount of people involved with this event including the 250 volunteers, the mechanics' controllers, sound and lighting, and so on. Huge thanks to who made this weekend possible, you for sure gave the 75,000 people who attended, a show to remember. As always, more pictures and a video below!